Tap on an app > Daily Timer > choose the timer limit > tap SAVE. This additional limit will work within the daily allocated device screen time. The app gets blocked when the timer is up even if there’s still Scheduled or Allocated time left on the device. When the device is out of time (or is in a time-out) and the app still has time left, the app will get blocked too! Only available from your Android and iOS parent device. Our web dashboard doesn’t support this new feature. A redesigned Child Mode dashboard provides “digital awareness” for your kids by allowing them to review their own daily app usage (and how much time is left on any app daily time limits). Encouraged apps that do not count down screen time show up as shortcuts on My Dashboard, My Stats shows today’s app usage and our Family Messenger is easily accessible via our new tabbed design. Kids can also review which apps have a daily limit, how much time is left and which ones are now out of time. We have more planned for this feature, got ideas? I’d love to hear from your personal experience. Only available for your child’s Android device(s). Child Mode – block of swiping notifications down when time’s up. This should help with kids replying from notifications which do not require opening the app (ie: texting after hours). Read more here. Child Mode – updated list of web browsers we block. Child Mode – block “floating” video windows when time is up. Bad news, thanks to Apple. 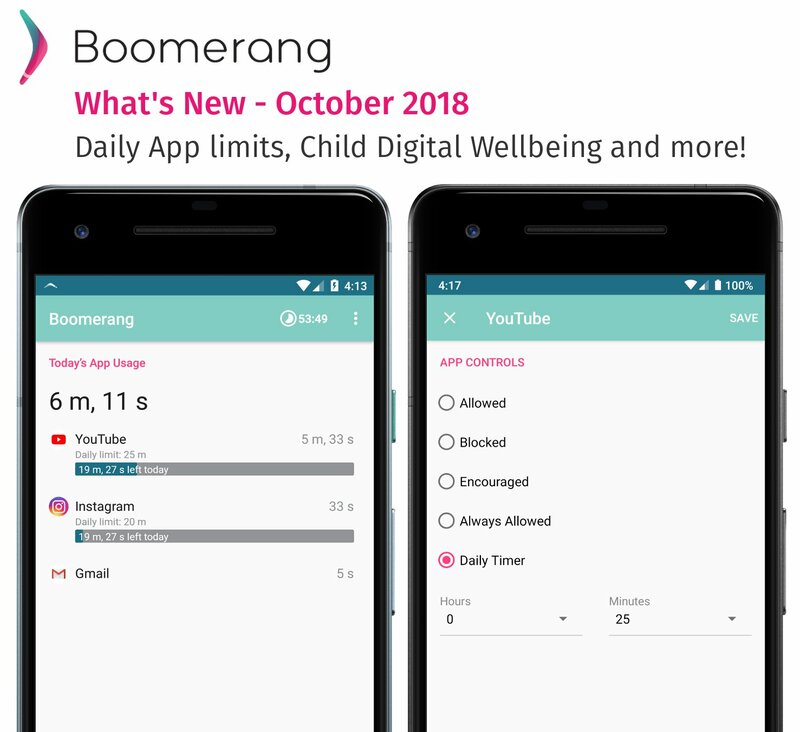 Apple no longer allows apps on the App Store that use the Device Management Profile for parental controls so the new version of Boomerang no longer has screen time, app and content controls. This has started to affect not just Boomerang Parental Control but other parental control solutions such as Screen Time, Qustodio and others with whom I’ve personally discussed this development with. The timing is suspect since with Apple’s iOS12 update brings their own approach to Screen Time and app controls. Apple has removed customer choice on their platform, copied the innovators and added features inside iOS12 that only they can access. But I love Boomerang on iOS, what’s going to happen? The new version of Boomerang for iOS required us to remove the Device Profile step from our Child Mode. We continue to be committed to our Parent Mode for managing Android devices better but our iOS Child Mode is officially limited thanks for these Apple guideline changes. You can add your feedback directly to Apple in this active forum: https://discussions.apple.com/article/HT208982. What if I want to keep using Boomerang on my child’s iOS device? We will continue to offer our SPIN Safe Browser and when used with Boomerang, parents will still be able to review their child’s web browsing history. Our popular Family Messenger feature will continue to work across Android and iOS families and location tracking. For current users, as long as your child doesn’t remove the Device Profile, you will still be able to control it via your device including our scheduled screen time. At this time, we do not plan to shut down the infrastructure that allows the commands to work but will not be able to provide a reinstall option. If you feel to share your thoughts about this with me, I would love to hear from you. 5. **NEW** Daily App Timer for non-iOS devices. Limit any app for specific times independently of the device screen time. ⭐️Per app daily timer: set daily time limits for any Android apps on your child’s device. Control via Parent Mode. ⭐️Digital Wellbeing for you child with our redesigned Child Mode’s My Stats tab. Shows your child’s daily app usage and app limits. Product evangelist for Boomerang, battling the constant love/hate with tech. I do my best to keep the balance in teaching our kids good tech behaviours. Boomerang is all about applying this and more.